Check out this necklace that Amy made. I love it!!! 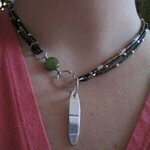 Amy is the owner of Aplcreations, which features very original jewelry and folk art goodies. But this, this one is something I just had to rush you all over to take a look at! And I forget to mention Anette's cute little advent calender on her blog. I love her little mischievous characters. She has a limited edition of cards and calendars available too. And how in the world did Molly Chicken not show up on my blog radar until today? I love the penguins on her site. Since she has the pattern there, I think two may have to spring to life on my work table. My girls would love them. And one more, Claire has just started a blog, but it's already filled with great little bits for you to read about. She's quite the knitter along with being a talented illustrator. I'm a big fan! I'm going to make some of the crocheted flowers. My youngest has a cheap fake flower she's been pinning to every outfit, I need to help her out a little with that! Lyn beat me here, I see! She is so very pushy, you know! I wanted to pop in and say that her blog is a joy because of it's humor. And she says all those cute English things like "Bob's your uncle" even though my uncle's name is really Jerry. Glad you found her, Heather! Thanks for the link, Heather! I too enjoy Molly Chicken...her little animals are the sweetest things.